Labeling Urethane Wheels – Wear Resistant Wheels! Labeling Urethane Wheels are manufactured at Plan Tech from the very best of raw materials produced by internationally renowned chemical companies who are industry leaders. Are you looking for Labeling Urethane Wheels that offer unbeatable physical properties? Then we are glad to let you know that you’re at the right place. 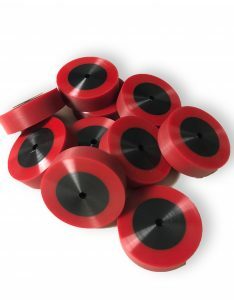 Our Labeling Urethane Wheels are renowned in the sector due to their offering of great value for money. When it comes to resisting wear, abrasion, chemicals, and corrosion, etc. The labeling urethane wheels produced in the state of the art in-house machine shop at Plan Tech are second to none. With our utilization of top grade materials and the exceptional technical expertise of our team of professional. We are ranked among one of best companies in the sector that manufacture Labeling Urethane Wheels that can stand not just only the test of time, but that of unfavorable weather and environmental conditions. To ensure that our Labeling Urethane Wheels are consistently made of high quality, our gurus always make sure to apply speed and precision which not only allow us to produce labeling rubber wheels that meet the qualitative requirements of our customers, but also their high volume demands within the quickest turnaround possible. At Plan Tech our labeling urethane wheels and parts are produced by expert engineers and chemists that are vastly experienced and skilled in the field. They input their best to ensure the very best output of urethane parts. Are you interested in cast urethane rubber seals? Please Contact us so we can help solve your requirements and work with you on your specific application!